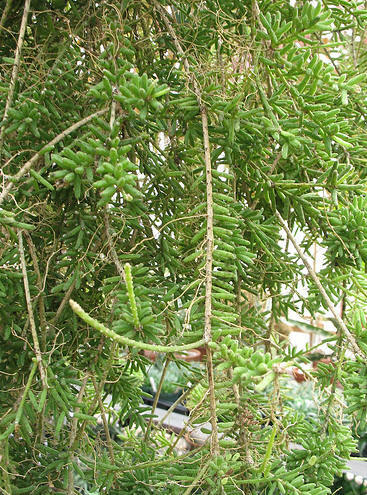 This pencil type is easy to identify because it is the only Rhipsalis made up almost exclusively of stems lined with tightly packed tiny branchlets. White flowers; white fruit. Fruit - short-oblong, 5 mm. long, white or tinged with red. DISTRIBUTION. Brazil (Rio de Janeiro): both sides of the Baja de Guanabara, epiphytic, at < 600 m altitude. The etymologically correct and commonly used spelling of this epithet is employed above. Haworth's original spelling being treated as an orthographic error. 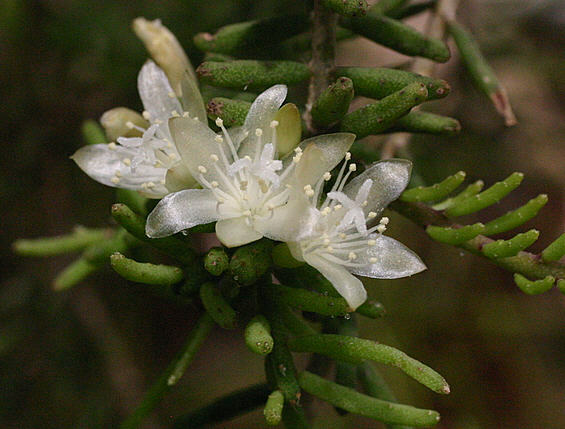 Plant with branches close together, branches erect , tubular, jointed close together, lateral joints on both sides compactly terete, tapering gradually, bearing flowers with a clouded middle, clusters of bristly hairs, pale white later more or less black. Flowers solitary. Grows in Southern America. Joints to lateral branches, numerous, compactly sub erect. Flowers small white, in middle (not at top) of the branches. Fruit white.